Get the essential Ladakhi experience of gorgeous mountains and high-altitude lakes on a short, 7-day itinerary. 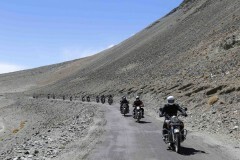 You'll visit the multi-coloured lake of Pangong, travel to the sand dunes of Hunder and Sumur, ride through high-altitude passes of Khardung-La and Chang-La, visit the historic monasteries of Thiksey and Diskit, apart from a range of other exciting adventures. Ladakh, the land of high mountain passes, is also the land of extraordinary beauty. 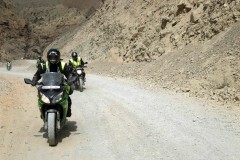 The Ladakhi terrain, flanked by the towering mountains of the Trans-Himalayan range, with snow-capped summits rising far beyond the clouds, is home to one of the most iconic motorbiking routes in the country. With scenic views of the landscape, painted in differing shades of grey and brown, you'll explore faraway villages and secluded landmarks in the region on a 7-day motorbiking itinerary. 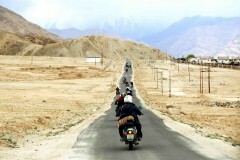 Your adventure begins from Leh, the largest city in Ladakh. After exploring the city, you'll take a few days to explore the sand dunes of the Nubra Valley, spend a night by the famous Pangong Lake and return to Leh, ending the tour with unforgettable experiences. 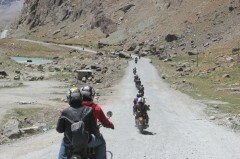 • Get the highlights of Ladakh on a short, 7-day itinerary. In the morning, spend some time on the banks of the Pangong Lake, visit the area featured in the popular Bollywood movie '3 Idiots' and travel back to Leh. On the last day of your motorbiking trip, you'll cross the high-altitude Chang-La Pass, often layered with thick snow all over. Overnight in a hotel at Leh.